Our women's flannel shirts are selling out quickly. Grab them before they're gone! Say hello to a collection of freshly updated flannels that can be seamlessly incorporated into any wardrobe. 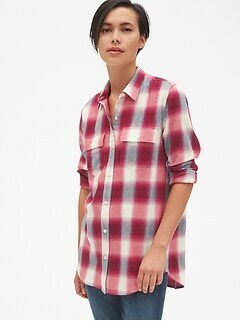 Gap women's flannel shirts have been updated to give women a feminine, refined silhouette. Not your grandfather's shirts, our flannel shirts for women are constructed to fit and flatter a woman's shape. Not just for hanging out in on the weekends, modern silhouettes mean they can be paired with skinny jeans and heels, tailored shorts, and pencil skirts for outfits that are sleek and ladylike. Shop tunic, boyfriend, fitted, and western style plaid shirts made from different fabrics. You have lots of variety when it comes to plaid--choose subtle patterns or bold ones in muted hues, rich jewel tones, or striking black and white. 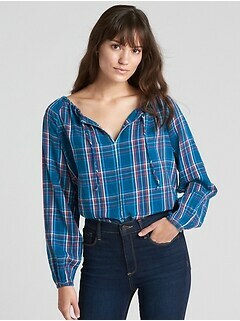 Gone are the days of stiff, boxy shirts that made you feel you were more of a lumberjack than a chic trendsetter. Women's plaid shirts are cut to subtly follow the curves of the body, revealing your waistline while still keeping you comfortable. Even our boyfriend styles have just enough sass appeal to keep them flirty. Enjoy the fluidity of soft rayon weave and the smooth structure that cotton provides. They hug the torso in a layer of softness. 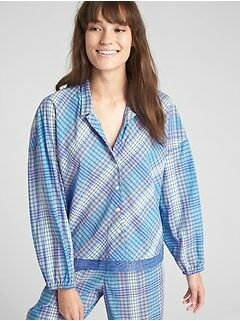 Details such as curved and subtle hi-low hems keep plaid shirts for women fresh and youthful, while double button cuffs give you an adjustable fit around the wrist. Roll the sleeves up or keep them neatly buttoned. There are many possibilities when it comes to styling women's plaid shirts. Not just for lounging around, they are versatile pieces that add color and even polish to many outfits. As your casual wear regulars, plaid flannel shirts for women can be worn layered over a tee with leggings, boots, and a slouchy beanie to hang out with friends on your days off, or with skinny jeans and heels for a lunch date. For an effortless look that screams sophistication, wear your favor selection unbuttoned over an all black outfit. Think you can't possibly wear these shirts at work? Think again. Whether it's your quarterly review or a day filled with work meetings, an a-line mini skirt, chic flats, black tights, and a colorful plaid shirt with get you through it all with confidence. 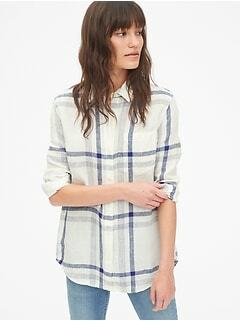 Versatile, pretty, and fun, women's flannel shirts from Gap will be in constant rotation in your wardrobe.